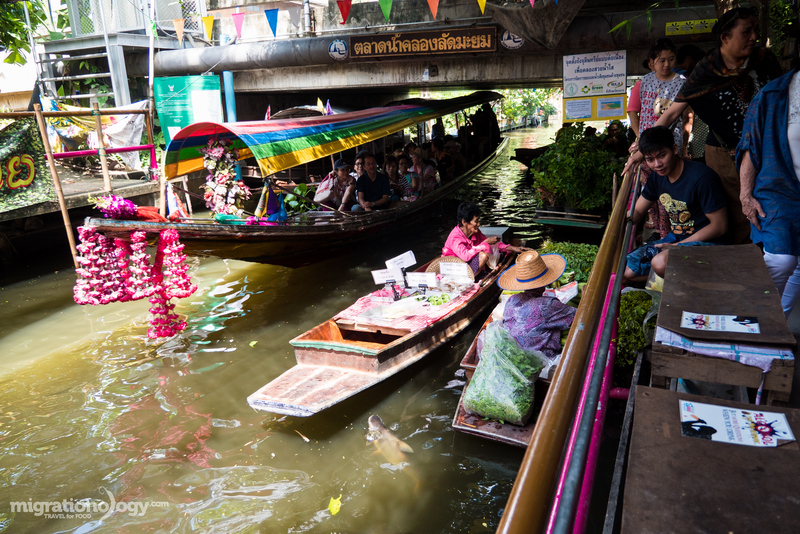 One of the most popular things to do in Bangkok is visit a floating market, and there are quite a few markets to choose from. 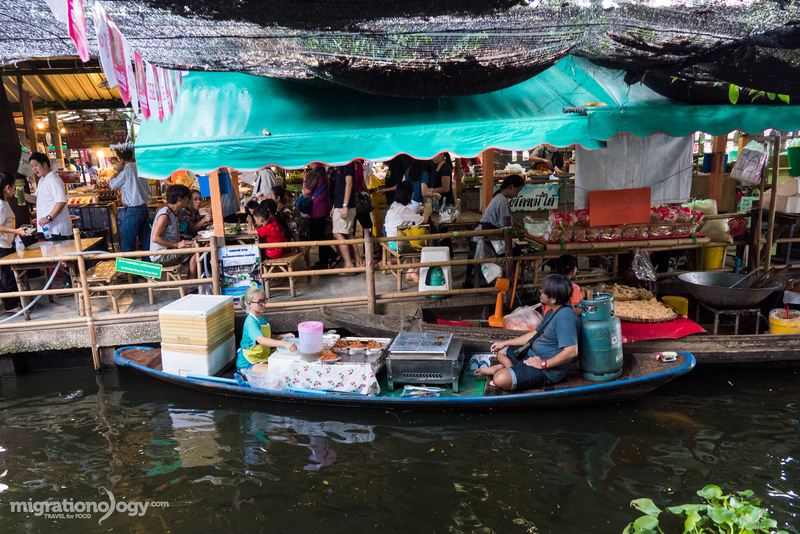 For the atmosphere, natural beauty, and most importantly for the food, Khlong Lat Mayom (ตลาดน้ำคลองลัดมะยม), a floating market located on the outskirts of central Bangkok, is one of my favorite floating markets in Bangkok. 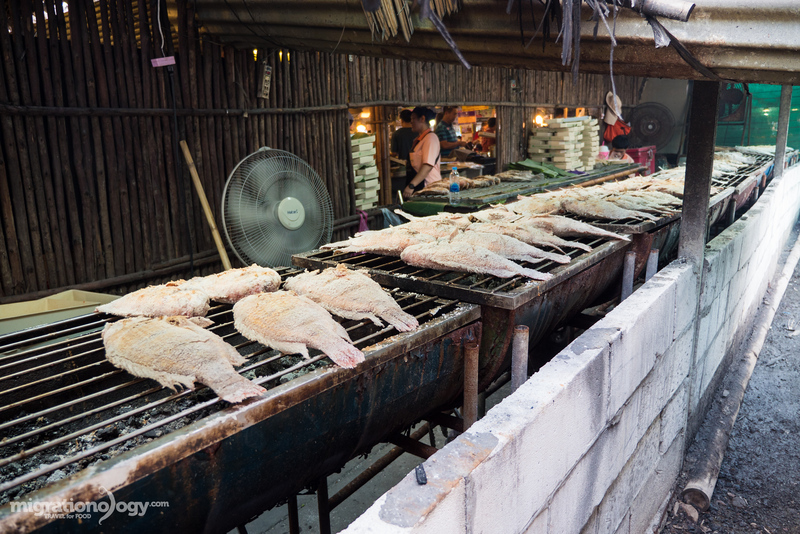 In this blog post I’ll be sharing all about the food, things to do, and what you can expect when you visit Khlong Lat Mayom. 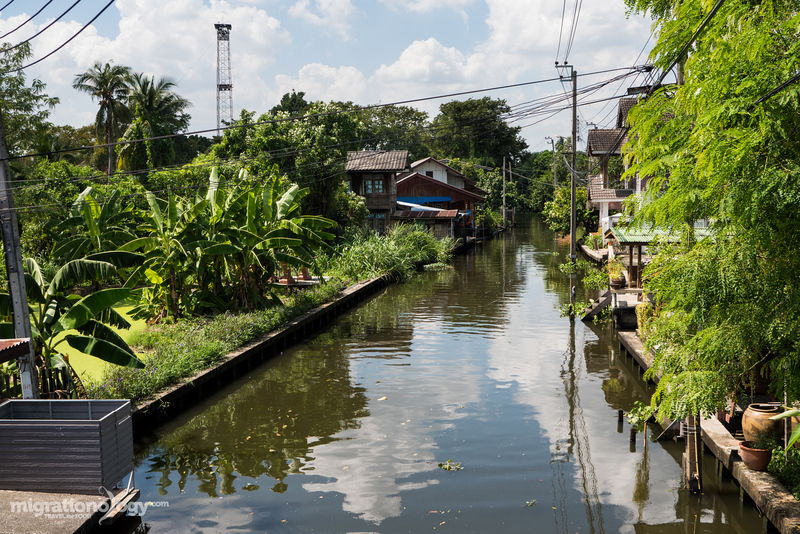 Due to the vast network of canals and waterways, Bangkok and the surrounding area, were formerly known as the Venice of the East. People relied on canals for transportation, and therefore people would tend to sell things directly from their boats, and congregate in certain areas to have floating boat markets. 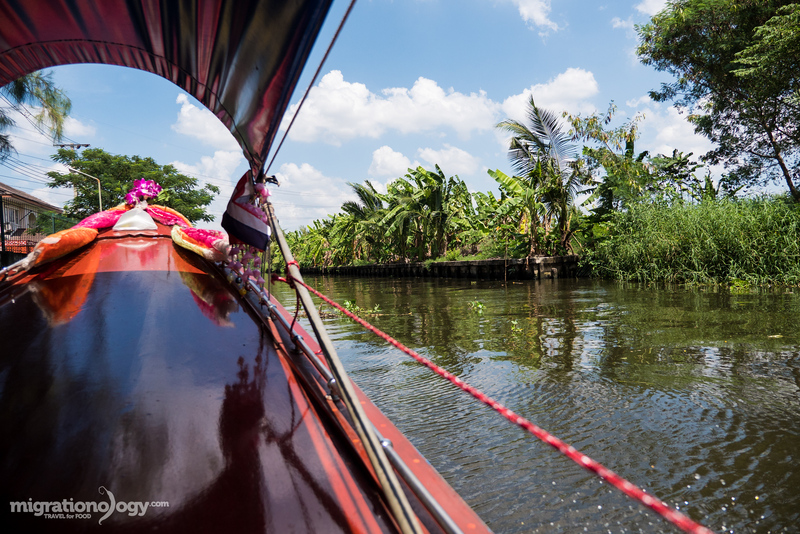 Fast forward to today, and although canals are still used as transportation in areas in and around Bangkok, many of the canals have been filled in to make way for roads, and boats and have turned into cars. 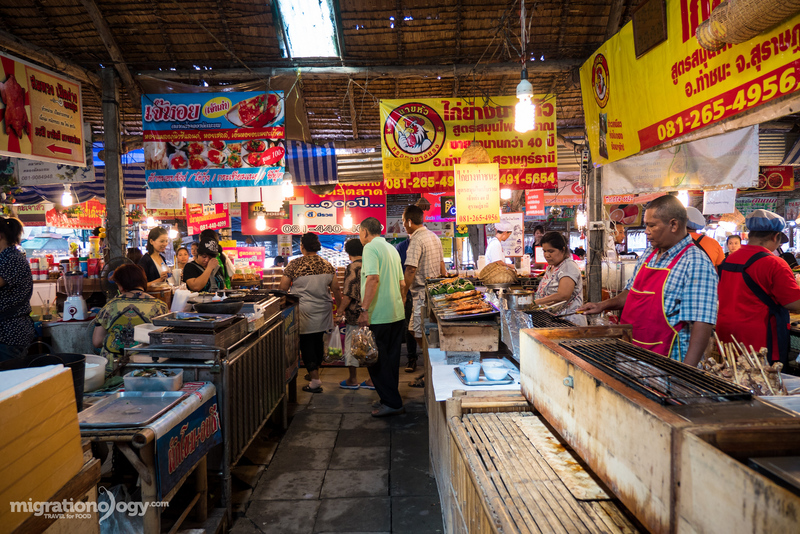 But visiting a floating market, while not totally so authentic anymore in Bangkok, has become a hugely popular Thai tourist attraction – and many local Thais go to a floating market on the weekend to walk around, do some some shopping, and most importantly: to do some eating. I’ve been to quite a few of the floating markets in Bangkok including Taling Chan, Bang Nam Pheung, and Talad Nam Kwan Riam (Ramkhamhaeng), but still one of my favorites is Khlong Lat Mayom (ตลาดน้ำคลองลัดมะยม) – situated in a lovely green lush area with an abundance of good food to eat. 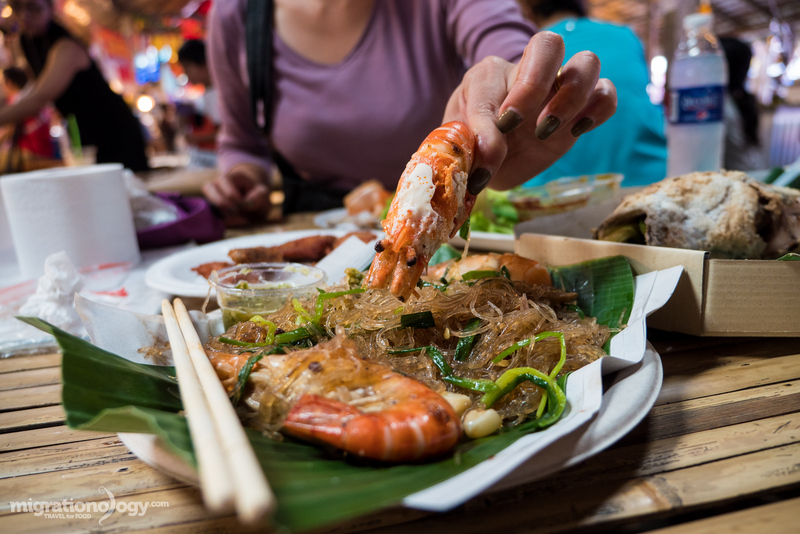 A couple years ago I wrote a blog post about visiting Khlong Lat Mayom (ตลาดน้ำคลองลัดมะยม), and at that time I thought it was one of the best weekend markets in Bangkok and it still is – so this is a much needed updated post. When I say floating market, don’t think of Khlong Lat Mayom as that image of a thousand boats in the river, brimming with food and color. 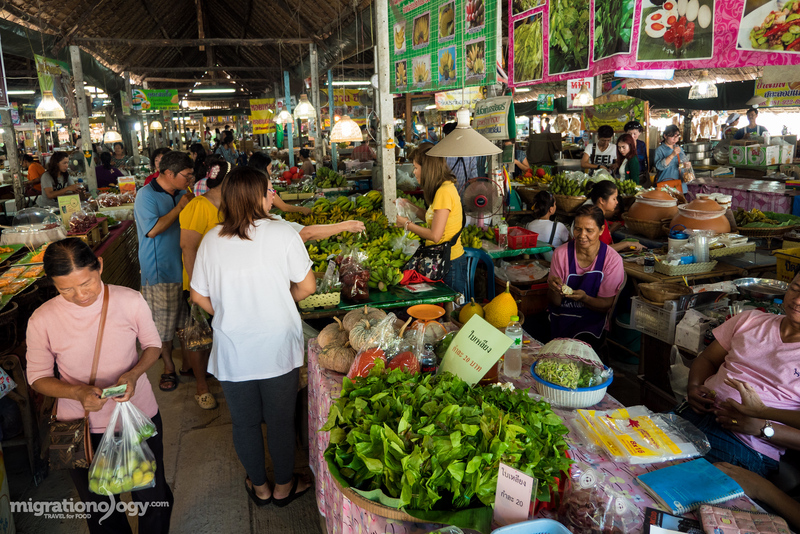 The actual “floating” part of the market is very quiet (while the non-floating part is massive), and there are just a few vendors who mostly sell things like potted plants and flowers and fresh fruits and vegetables from their boats, with just a few restaurant boats. 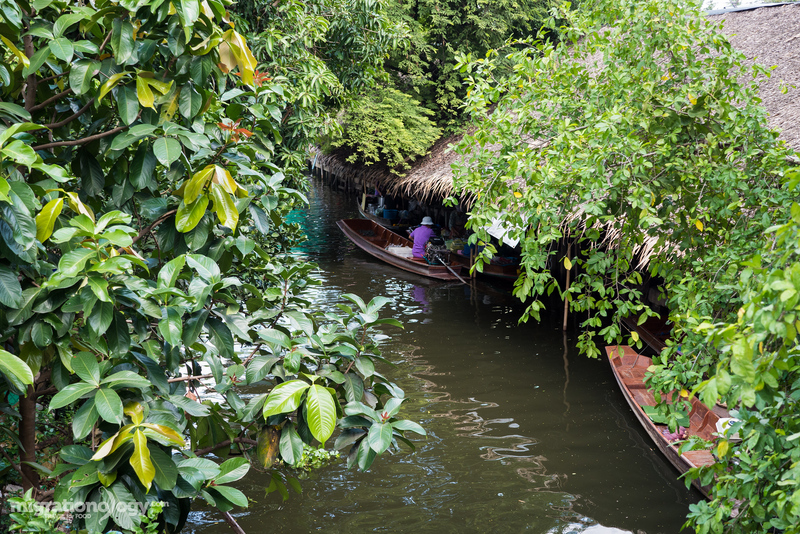 However, the canal is still used frequently as transportation in this area of Bangkok, and people really do sell things out of their boat – so although the market is very Thai touristy now, it still a little bit authentic, and a lot of fun. Let’s start with the food because that’s one of the top reasons to go. Due to the abundance of food available and how good it looks on display, I can almost guarantee you’ll be ready to start eating when you arrive. Khlong Lat Mayom Floating Market (ตลาดน้ำคลองลัดมะยม) is pretty good sized sprawling market (even though it looks small from outside), so it’s a good idea to take a look around quickly before you sit down. From the main road, I like to go to the left side of the market, and then go through the market to the canal-side, and there are some bamboo picnic tables, kind of in a food court seating area, which is one of my favorite areas to sit. The tables are first-come-first-serve, and if you grab a table, you can then start buying food from all the different stalls, and bringing everything back to your table to start eating. 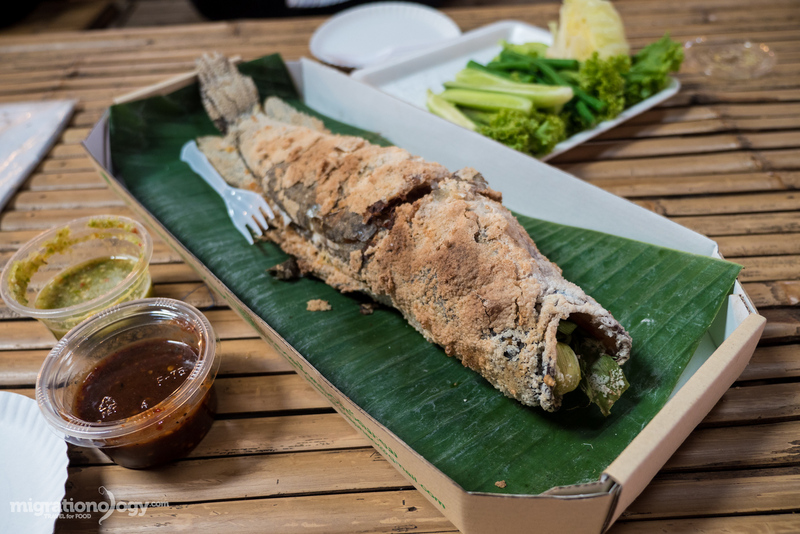 One of the absolute best things to eat at Khlong Lat Mayom and at any Bangkok floating market is pla pao (ปลาเผา) – Thai salt crusted grilled fish (you can check out my recipe here if you’re interested). 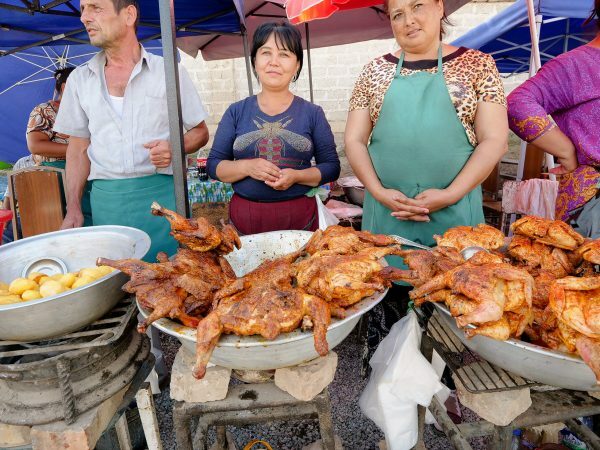 There’s a stall right in the middle of the market that grills some serious fish. They have about a dozen half barrel grills lined up, and they probably grill a couple hundred fish at a time. You can either order snakehead fish, tilapia, and I also saw that they had some barramundi as well. I got the snakehead fish, known in Thai as pla chon pao (ปลาช่อนเผา), and they dished it onto a pizza like box, with some sauce and vegetables. The grilled snakehead fish (ปลาช่อนเผา), despite its scary looks, was incredibly delicious. It was fresh, and grilled so it was moist. The sauces were also quite good. One was a typical Thai seafood sauce with garlic, chilies and lime juice, and the other sauce was a roasted chili sauce with a touch of giant water bug essence in it to give it a unique twist. There are a couple stalls selling goong ob woon sen (กุ้งอบวุ้นเส้น), but for myself, the superior stall is a few minutes walk down the left side of the artfully preparing goong ob woon sen (กุ้งอบวุ้นเส้น). If you love shrimp, you’re going to love this. After you order, they take the contents of the individual pot, put it onto a plate, and you can then bring it back to your table. After Somsak Boo Ob, this was one of the best versions of goong ob woon sen (กุ้งอบวุ้นเส้น) that I’ve had in Bangkok in a long time. The mungbean noodles were flavorful with garlic, ginger, black pepper, and a hint of Sichuan pepper, and they had a perfect sticky, yet not mushy, texture. The freshwater shrimp weren’t overcooked, and they were meaty and creamy. The accompanying sauce was also good, nice and garlicky, a little spicy, and balanced with both sourness and sweetness. The combination of the sauce with the prawns and mung bean noodles was excellent. Along with roasted fish, I’d give the goong ob woon sen (กุ้งอบวุ้นเส้น) a high recommendation – especially if you’re a shrimp lover. We did eat a few other small snacks, but after the grilled fish and shrimp and mung bean noodles, I was so happy, I didn’t really even need much else… at least for a little while. 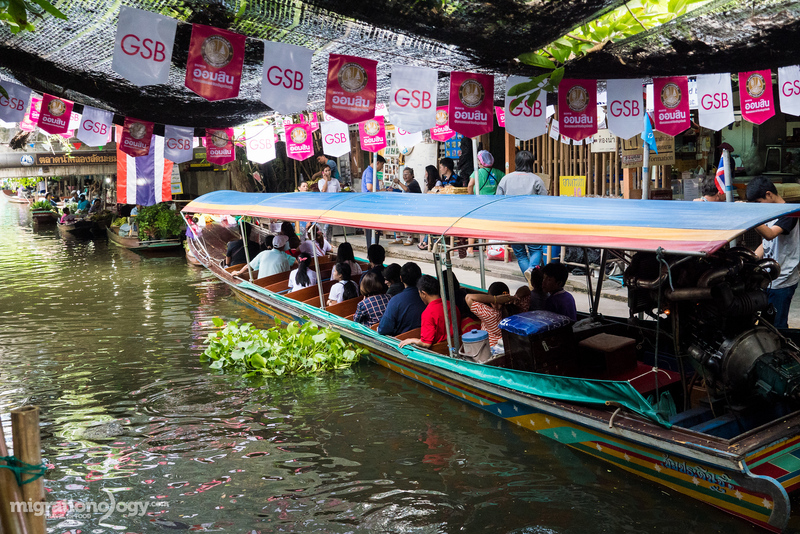 Along with a great selection of food and nice atmosphere, another reason I think Khlong Lat Mayom Floating Market (ตลาดน้ำคลองลัดมะยม) is one of the best floating markets in Bangkok is because of the boat ride tour. Right at the center of the market along the canal they offer longtail boat tours, which are communal, and very affordable. 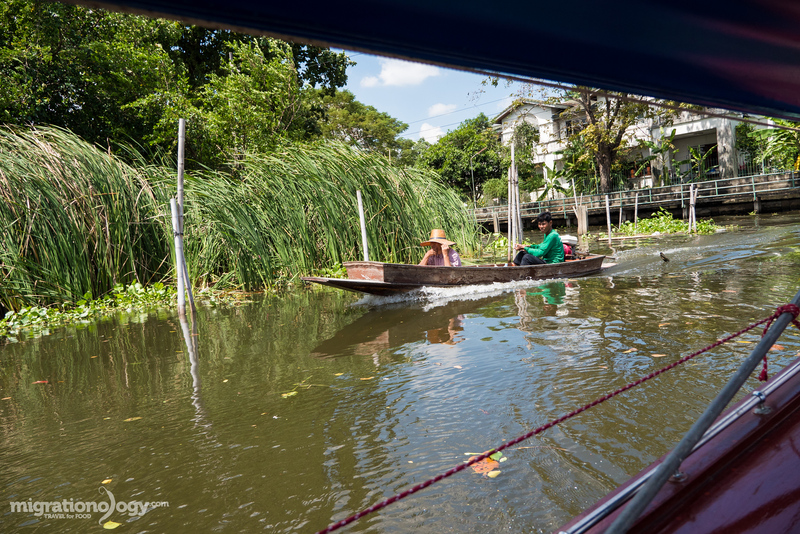 You can either choose to take the boat ride tour with a stop at the temple, or a boat ride tour with a stop at a homestay. We chose the homestay route, bought our tickets for just 50 THB ($1.40) per person, and waited for our boat to fill up in about 20 minutes. Then we were off with about 15 other people in our boat. We rode in the boat through the canal, passing through neighborhoods, homes, gardens, small orchards, and businesses. It’s so beautiful and a throwback to the old days of Bangkok to be sitting in a boat cruising through the canals. After about 30 minutes of riding, we got off at a small village, and walked around a couple of old houses, and a community. There was a small coffee shop at one of the homes, and I took to opportunity to fuel up on a much needed iced coffee. We then walked through the lush greenery to a different canal where the boat driver picked our whole group back up. The boat ride again took about 30 minutes to get back to the main part of the floating market. The boat trip tour at Khlong Lat Mayom altogether took about 1.5 hours. I honestly didn’t think I was going to like it that much, but it was actually quite enjoyable, and I’d really recommend taking the time to do it if you visit – and you can’t beat the 50 THB ($1.40) per person price! Time for some more food! The boat trip was a good little stomach break, and when I arrived back, I had built up a little bit more of an appetite. 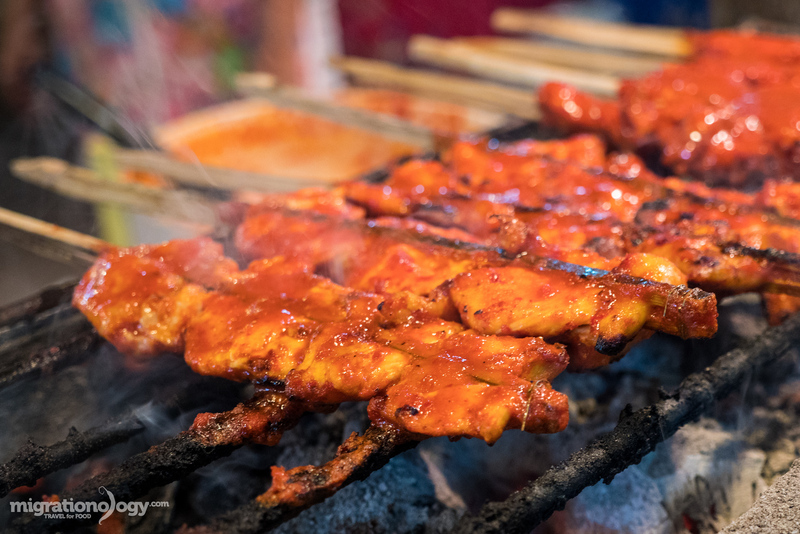 The first thing that caught my attention was a stall selling gai galae (ไก่กอและ), one of my favorite types of Thai grilled chicken from the south of Thailand. It’s quite difficult to find in Bangkok, so I always jump at the chance to have it. The chicken was grilled and coated in a southern Thai bbq sauce made from coconut milk and dry chilies. It was a bit sweet and creamy, and had a nice nutty and smoky chili flavor to it. I also stopped for some miniature pineapple, which were from Chiang Rai. 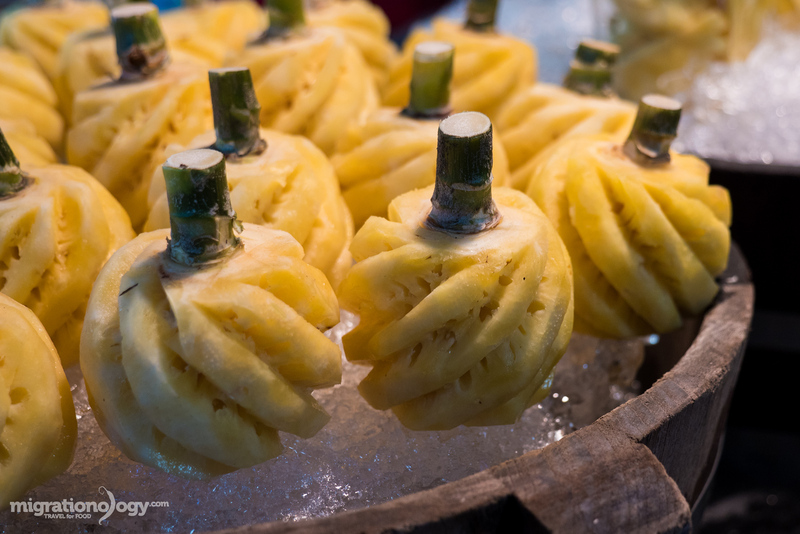 The drumstick sized pineapple, which is known for its sweet, juicy, and crispy texture in Thailand, was excellent, and a refreshing way to end the day at this floating market Bangkok. Finally, this brings us to the last and final reason Khlong Lat Mayom is such a pleasure to visit: the leisure and relaxation. Although the market does get packed our and busy on peak times during the weekend, Khlong Lat Mayom is still a pretty calm and friendly market. It’s a great place to spend a few hours leisurely walking around, and sitting at a table eating and contemplating your next thing to eat. In Bangkok, but feel so different! 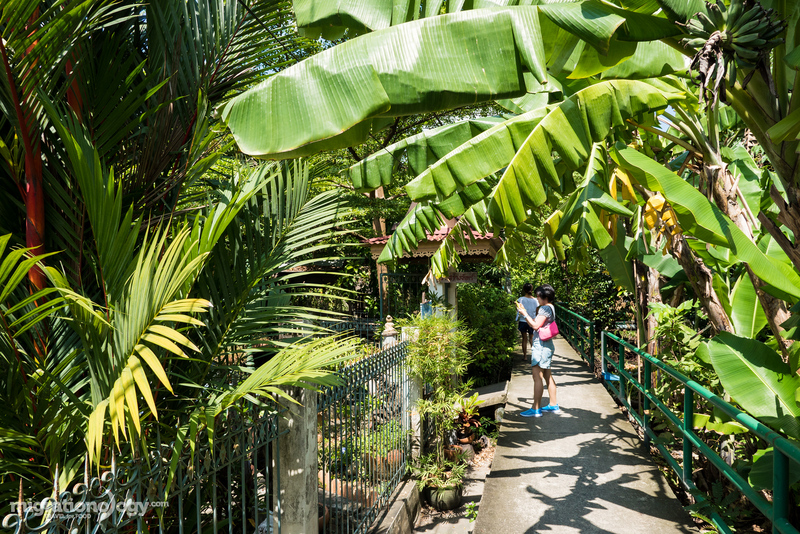 The market is just far enough from Bangkok to make it feel like you’re deep into the countryside, yet so close to Bangkok that if you were to peek above the canopy of trees, you could probably see some skyscrapers. Within the market you feel far removed from the city life, which is great. When you’re about to leave the market, make sure you stock up on some snacks to bring home. 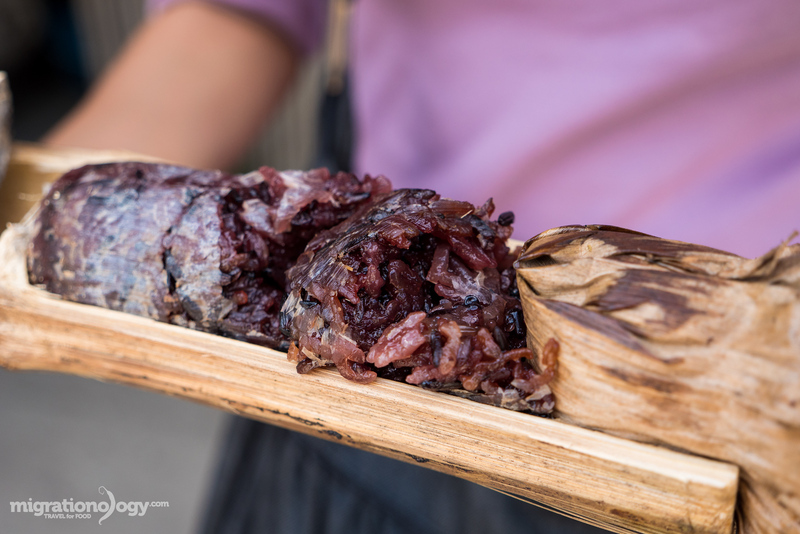 My wife in particular really loves khao lam (ข้าวหลาม), sticky rice combined with sugar and coconut milk, all stuffed into a pole of bamboo, and slow roasted on a lean-to. 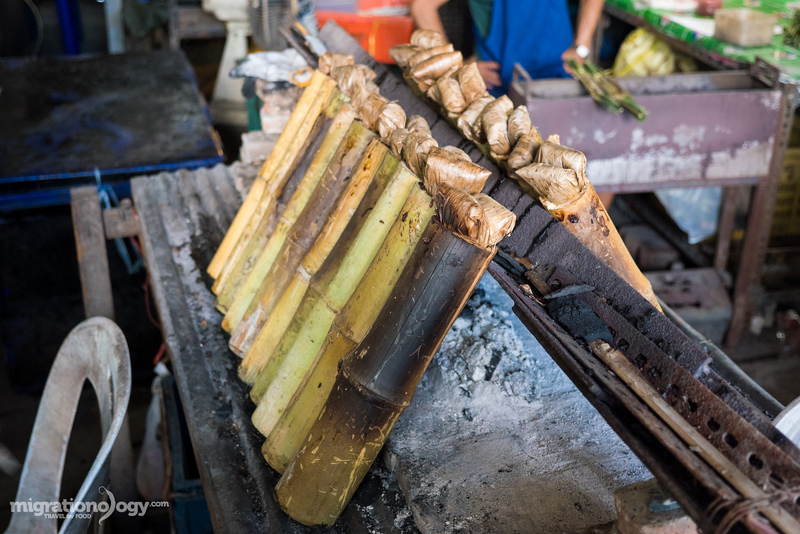 The slow roasting and cooking process makes the rice creamy and sticky, and almost to the point of custardy, and it should have a nice bamboo tasting flavor to it from being roasted in the green bamboo. It was a good version! It’s not always easy to find a good version of khao lam (ข้าวหลาม) in Bangkok, but Ying and I sampled it right as we were leaving the market, and it was quite good. The top was creamy and sweet, while the bottom of the rice was less sweet and less rich – the coconut cream and sugar rise more to the top. 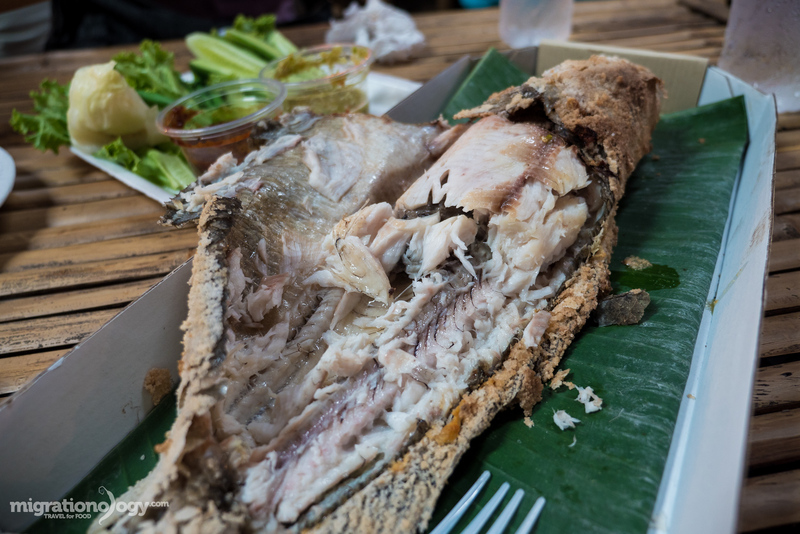 That was our final bite at Khlong Lat Mayom Floating Market (ตลาดน้ำคลองลัดมะยม), before we jumped in a taxi to head back to central Bangkok. 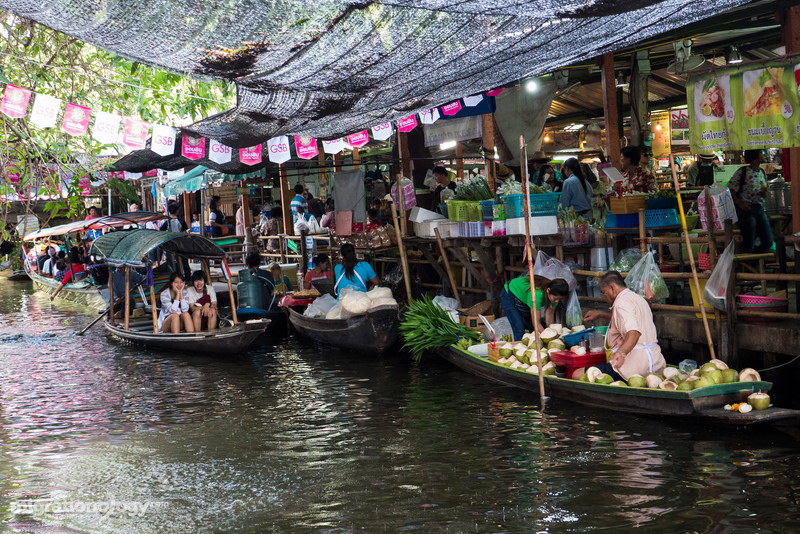 If you love food, relaxation, and markets, a floating is a great place to visit when you’re in Bangkok. Although there are many different floating markets throughout Bangkok and the surrounding region, one of the best (at least I think), for the abundance of delicious food and relaxed and beautiful atmosphere, is Khlong Lat Mayom Floating Market (ตลาดน้ำคลองลัดมะยม). 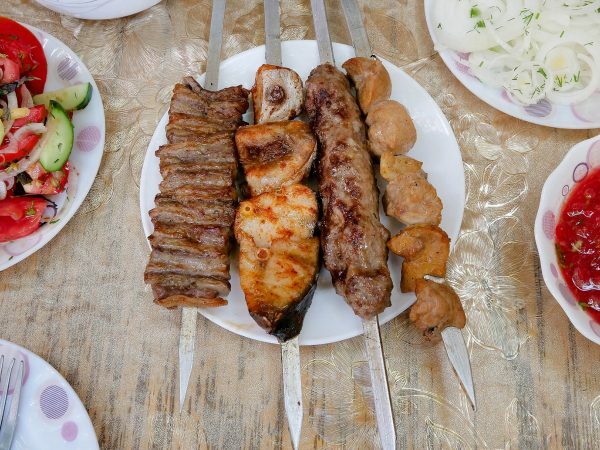 One of the main reasons to go is for the food, and you shouldn’t miss eating a grilled fish or two when you go. But in addition to eating, you can also take a boat tour, which is quite fun, and just leisurely walk around and enjoy the lush green area. Khlong Lat Mayom remains one of my personal favorite floating markets, and one of the attractions you shouldn’t miss when you’re in Bangkok. Open hours: 9 am – 4 pm on Saturday and Sunday and major holidays (closed on weekdays! ), I think it’s best to go around 10 am or so. BTS and Taxi – Take the BTS Skytrain to Bang Wa station on the Thonburi side of Bangkok. From Bang Wa, jump in a taxi, tell the driver Talad Nam Khlong Lat Mayom (ตลาดน้ำคลองลัดมะยม), it will take about 15 minutes to get to the market and cost about 80 THB ($0.70). Direct Taxi – Depending on where you’re staying, especially if you’re in Silom, Sathon, or around Khao San (Banglamphu), I’d recommend skipping the BTS, and just taking a direct taxi (should cost about 120 – 180 THB to get to the floating market). I took a taxi from the market back to Khao San area for 125 THB ($3.51). 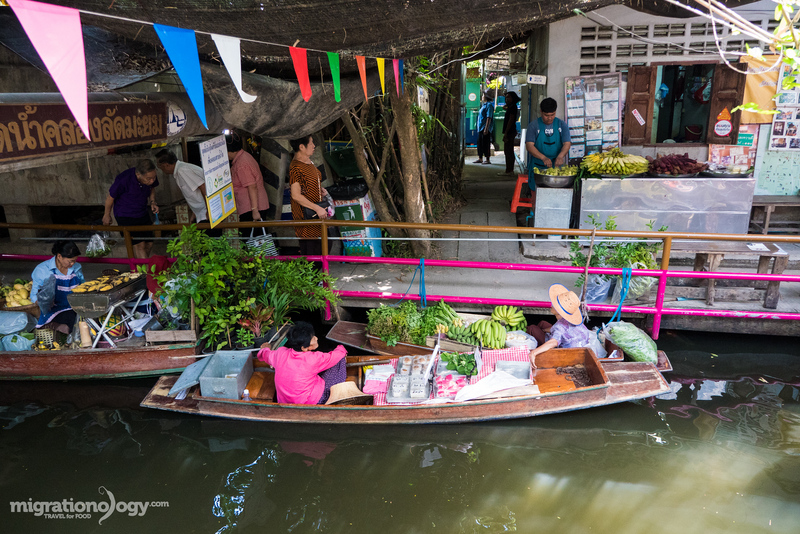 Have a great time visiting this floating market in Bangkok and hope you enjoy the food. What do you want to eat at the market? I’d love to hear from you in the comments below! 59 comments. I'd love to hear from you! Hi Mark, After I watch your video in YouTube and I find HuaHin. Now I would bring 47 people of my colleagues from China to Hua Hin and eat in the place where you ate! 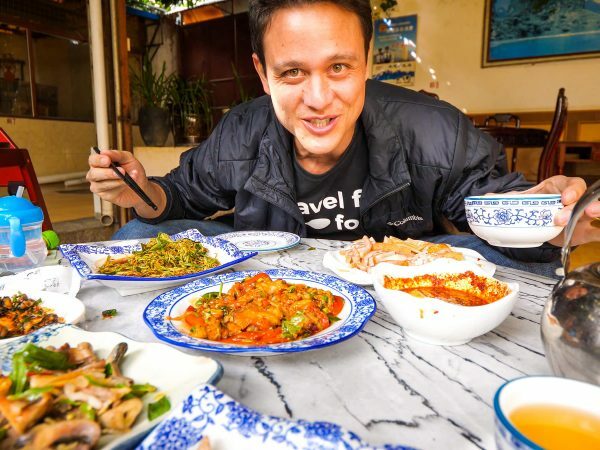 Could you give me some idea in Bangkok for a group dinner of 48, most local delicious Thai restaurant with limited budget, as we would stay one night in Bangkok before leaving. Hey Mark, we will be arriving in Bangkok in two weeks and built our whole trip around your recommendations! Can’t wait for it! How long should take the travel in direct taxy between Khao San (Banglamphu) to Khlong Lat Mayom? Thanks! Hi, im from Malaysia and visiting Bangkok in June. Is taling Chan very touristy compared to Khlong lat mayom? Hi Mark, i love your show! Khlong Lat Mayom looks really interesting! I am looking for a also not touristy floating market with monks appearing in the foggy morning by the canal ! Do monks appearing in the morning at Khlong Lat Mayom? Great post. I am visiting bangkok during the weekdays only. Do you have any recommendation of a weekday floating market (mainly for food and not too far from bangkok city) other than Damnoen Saduak Floating Market? I’ll visit there coz of u. i love ur enjoyed face. i wonder how ur thai accent so clear , and are u half Thai? Wow, I have never been to Khlong Lat Mayom before and it looks interesting. 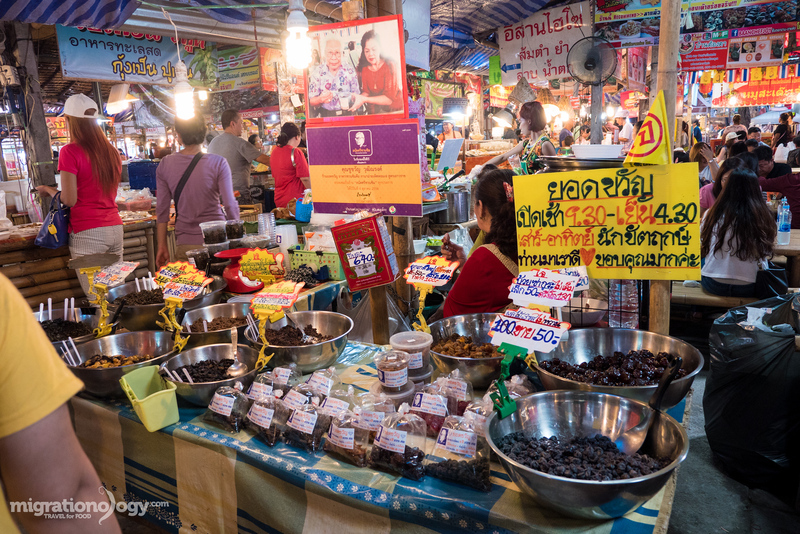 Some rare ingredients for traditional Thai foods of each direction tend to appear here as well. I think I will get many thing back home if I visit this market for sure! Hi Nannapat, great to hear from you. Thank you very much, hope you can visit Khlong Lat Mayom floating market! Thanks for the info, well done. Will be in Bangkok March 3 thru the 5th and definitely want to go to this market, then do the boat ride. Are the hours really till 4pm? I arrive on a sunday afternoon (1230pm) in Bangkok and its the only weekend I will be here. I’d love to visit here! Hi Mark, iv been following you on face book for some timr now and love your work. We’re in Bangkok next Jan for a few day’s we’d love to hire you fora few hours to try some street food is this something you do? Hey Ewan, great to hear from you, thanks for this piece of very interesting information! The floating market looks lovely and will try it in 2 weeks when we expect to be in BKK. Do you think the market is child friendly? will be travelling with 3 LOs and the oldest is only 7! We went to floating market last November this was one app 140 km away from Bangkok although 3hrs boat ride did cost us a fortune it was something we haven’t experienced before.Shame we didn’t know about Khlong Lat Mayom it looks much better that what we’ve visited last year.Hopefully we will be able to return to Thailand end of this year and this will be on our list whilst staying in Bangkok. P.S love reading your blogs ???? Next time I’m in Bangkok, I’ll definitely go there as I did not know about it. Thank you for such useful info and the great photos. Do you know if there are any guesthouses nearby? Thanks for your great information on Klong Lat Mayon Markets. 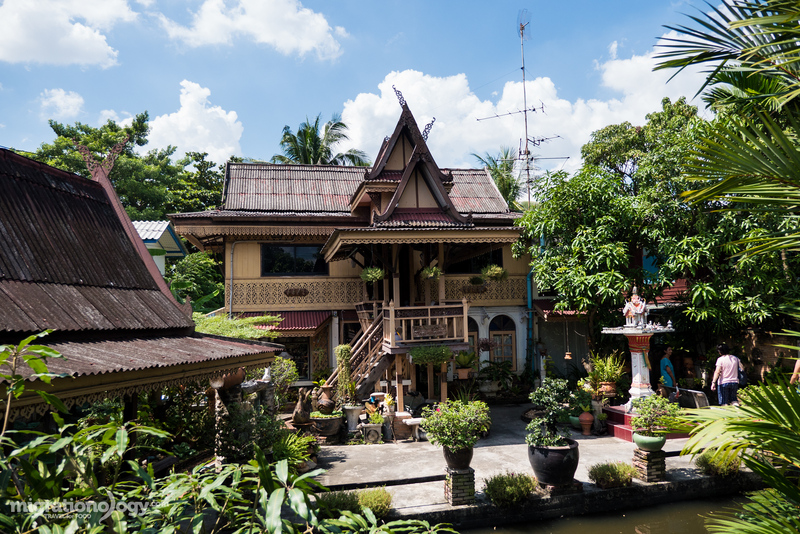 I am after your advise on the best way to combine the markets with Khlong Bang Luang Artist Village( Also known as Baan Sinlpin) and Wat Arun and the surrounding alleys and lanes. Do the long tail boats from Lat Mayom go anywhere near Baan Sinlpin? Trying to do all this on our last morning in Bangkok….. We are staying in Banglamphu area so will take your advice and get a direct taxi over. I am just concerned as to getting taxis to the other places as I am sure drivers won’t speak english. Can you offer any further advise please. I have always find floating markets very interesting. I could not experience it but defitinely soon. This article will be my guide when I get there. This is the second blog post that I have read. You are absolutely an excellent photographer. Thank you Mark. Hi Serhat, glad you find them interesting as well. This is one of my favorites located right in Bangkok. Do you know if boat ride tours are available also in rainy season? Hi AP, yes, they should still be running. Hey, that was a very insightful and interesting video. Thanks for sharing that. I’hv just subscribed to your channel on YouTube. Are there any other nicer and bigger floating markets closed to Bangkok city centre? Thank you very much Pranay. 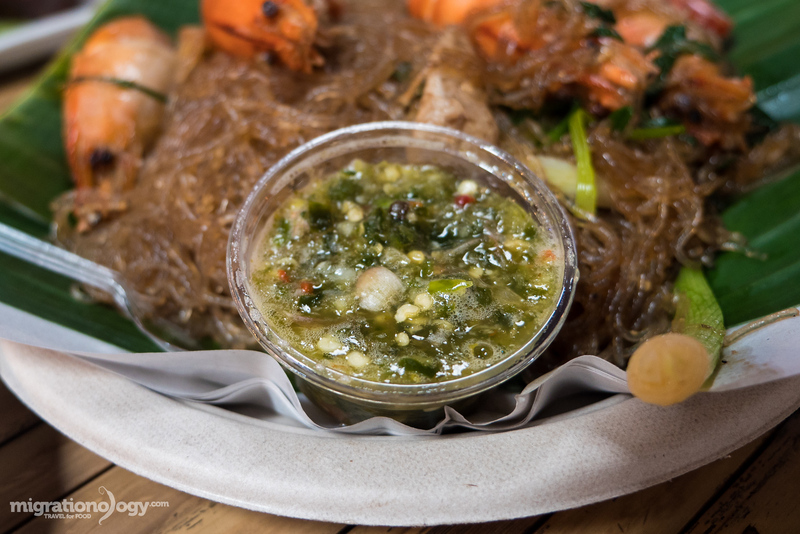 This is one of the best in my opinion, but you could also try Bang Nam Pheung. 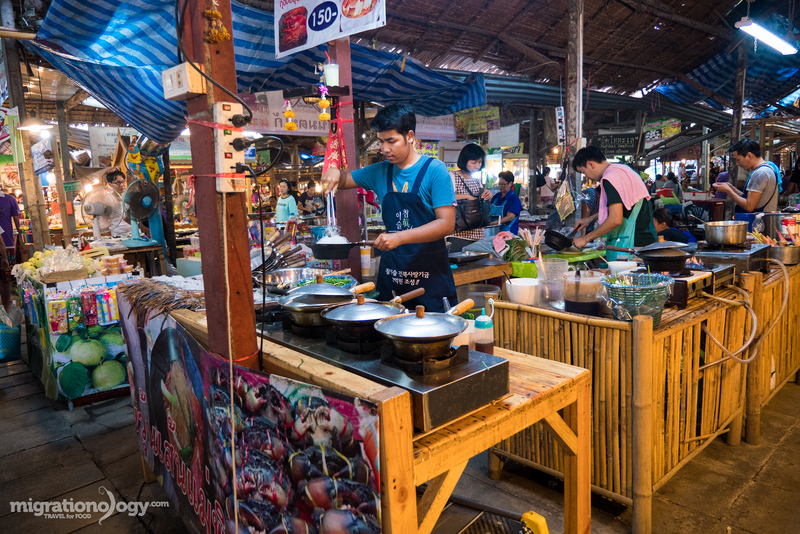 One of my biggest regrets was not visiting a floating market in Bangkok – especially this one, because all the food looks phenomenal! Goong ob woon sen looks amazingly delicious! I really enjoyed this post, will definitely remind myself to visit this floating market on my next visit to Bangkok. I am a big fan of you. Thank you for all the tips about Bangkok. Hey April, thank you very much for reading! We’re about to visit Bangkok next week but we have to come back on Saturday. We really love this place and hope to be there once. Do you think it will open on Friday – New Year celebration? Wow, what a mistake to read while feeling a little hungry. Now I need to go get some food asap! The goong ob woon sen particularly got my stomach rumbling. Thanks for the great pics! Haha, thanks Nathan, hope you got something good to eat! Great to hear you enjoyed this floating market! Hey Bee, good to hear from you. Food is really the highlight of living in Thailand for me. Hope you can come back for a food adventure! Hi Mark, love your videos/blog really helpful. Are there any plans on going to hong kong in the future? Keep it up! Thank you Philip, really appreciate you reading. I was in Hong Kong a few months ago, but haven’t yet been able to blog about it – I really love Hong Kong! Are you planning to go there soon? Thailand delivers so much for so little money! I am always in awe what you manage to dig up Mark … spectacular post as always! Thank you very much Frank, I agree! I actually tried snakehead fish when I visited Vietnam last year on a river cruise. They call it “ca loc” over there. It was a little salty, but so tasty. 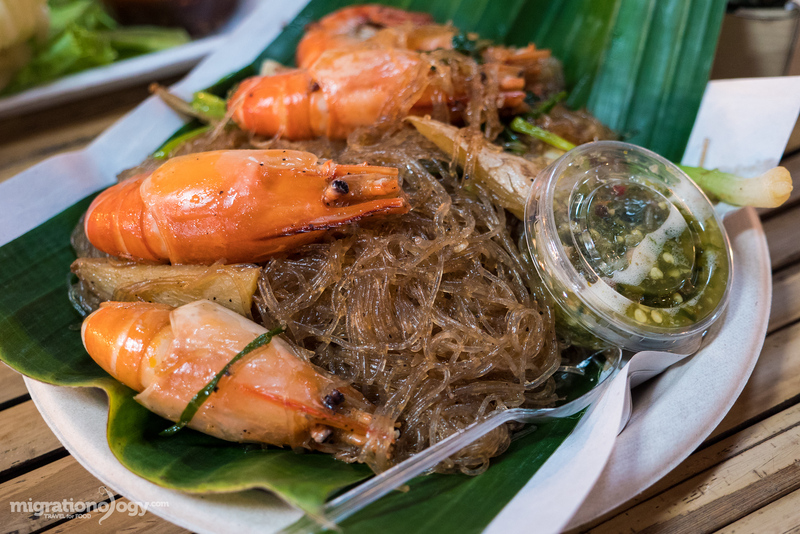 Those Bangkok shrimp look delectable! Hey John, good to hear from you, and glad you tried a snakehead fish and enjoyed it! This is exactly what I would describe as a perfect plan for a day in Bangkok. I will absolutely go here when I’m in Bangkok! That fish and those shrimp look ridiculously good (the good news is that my partner doesnt eat seafood- more for me!!) Another great post Mark! Thanks! Hey Jenn, glad you would like this floating market as well. Haha, nice, all the seafood for you! The floating market looks awesome and also the boat tour and the other markets are great. I`ve never heard about small sized pineapples, see it for the first time… I am not a huge fan of a shrimp but the mungbean noodlles are interesting and another dishes like grilled fish and roasted rice :-). 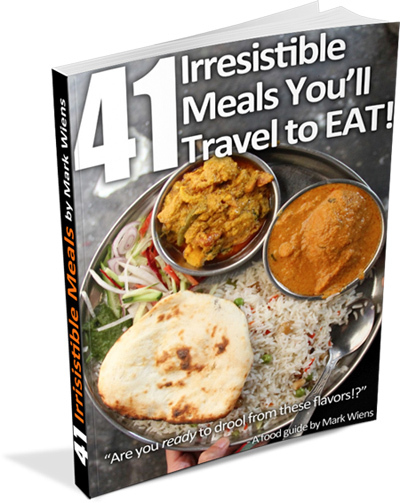 Must see ( must eat) when I will travel there! Hi Emilka, thank you very much for reading. Hope you can visit Khlong Lat Mayom floating market when you come to Thailand! All of that food looks amazing! Hopefully we can visit someday. We’ll be in Vietnam for the first time in January and hope to find some amazing food in their markets. Thank you very much Jacob, hope you have a wonderful trip to Vietnam!